4 star luxury development at the base of the French Alps best snow conditions and off-piste paradise. Year round activities and entertainment in the rejuvenated resort. Two bedroom, two bathroom tastefully decorated quiet apartment with full facilities for self catering or order room service from adjacent restaurants in the resort. Ideal accommodations for single family with bunk beds and additional pull out bed. Full music, Nintendo Wii and two video entertainment systems including a selection of videos. Wood fireplace and high sloped ceilings in open concept living, dining, kitchen area. Heated underground parking, secure ski / board / equipment locker, elevators to apartment access. Private terrace with spectacular mountain views. Pets considered. Private rental. Luxury resort amenities: Shops and restaurants in base of development. All towels and linens provided. Pool towels are available from reception. A baby travel cot is available upon request. The facilities are new, clean and well designed. As owners, we are delighted! 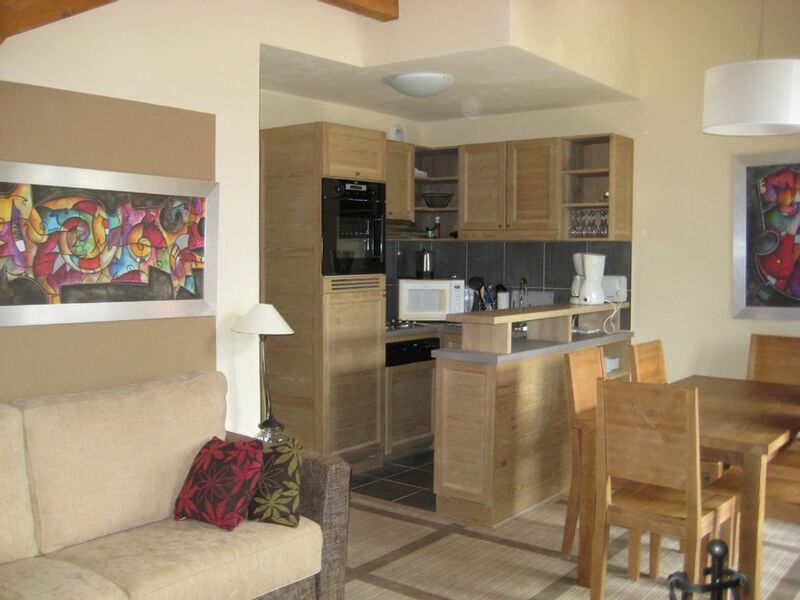 We have added a microwave oven, raclette hotplate, fondue set to complement the kitchen. This is one of the few units with a wood burning fireplace in the salon with logs available at the reception. Beautiful appartment in a very good complex. Well situated for ski in and out. The appartment was fully equipped and very comfortable. Outdoor pool was warm even in sub zero temperatures. Very pleasant steam room and sauna. We didn’t try the jacuzzi as it was very busy. The on site restaurant was popular and convenient although there is a free shuttle bus service into the town centre. Flaine is a quiet family oriented resort with little nightlife. There are some popular restaurants and a bowling alley but not much in the way of lively bars etc. The skiing was great and plenty of choice for a weeks holiday. Internet worked well and there were about 10 TV channels in English including all major channels. DVDs and board games provided. There was a minor problem with the fridge light which the owner had fixed within hours. Extremely efficient service. Enjoyed our stay very much - apartment is comfortable & functional. Uk channels on TV. Plenty of comfortable seating after a long day skiing is lovely. Small but perfectly formed kitchen. However care needs to taken guests aren’t leaving food .... odd smell on arrival - food left in fridge & on shelving. Ski locker area can be very tight for space at certain times but with a laid back manner it’s nothing to put you off this lovely hotel. We normally stay at Le Centuare but now prefer to stay here. Local shop at Helios is great - has everything you need. To pre book lift passes hotel reception need 24 hours notice. Under ground parking was a god send especially after heavy snow fall. Jon (the owner) was wonderful for information & made booking easy. Great views from apartment — Apartment is at the end of the corridor so no passing noise - quiet & private. Excellent property in a superb location! We had a great time here. We were a family of four with two kids aged 9 and 11 and it was perfect for us. It's proper ski in/out and the ESF picks up right outside the hotel. The hotel staff were very helpful and we made full use of the pool and spa facilities. There's also a great view of the resort from the apartment. The owner was very helpful during and after the booking process and very responsive to queries. Overall highly recommended. We definitely hope to return soon. Fantastic apartment with everything you need! A perfect resort and location for a family ski holiday. Flaine is a hidden jewel, come check it out! Nice and exciting experience in the heart of beatiful nature. Short 1 hour drive or easy transfer service from Geneva Airport. 30 minutes by autoroute A40 direction Chamonix and then take exit 19 and continue 30 minutes into the Grand Massif mountains well marked destination Flaine village. Local taxis and free shuttle buses to nearby bussling villages and ski stations, Morillions and Les. Flaine village is above 1500m elevation virtually ensuring a wintry setting for all snow sports and activities. Our Montsoleil resort is a self contained, all season, pedestrian resort perched just above Flaine village with easy access to all winter activities or golf and tennis facilities for the remainder of the year. This is a new property for us so we are open to discuss how we can meet your needs. Our normal change over date is Saturday but depending on availability, closer to the date we can be flexible. We are already getting enquiries for next season so do make reservations early to avoid disappointment.